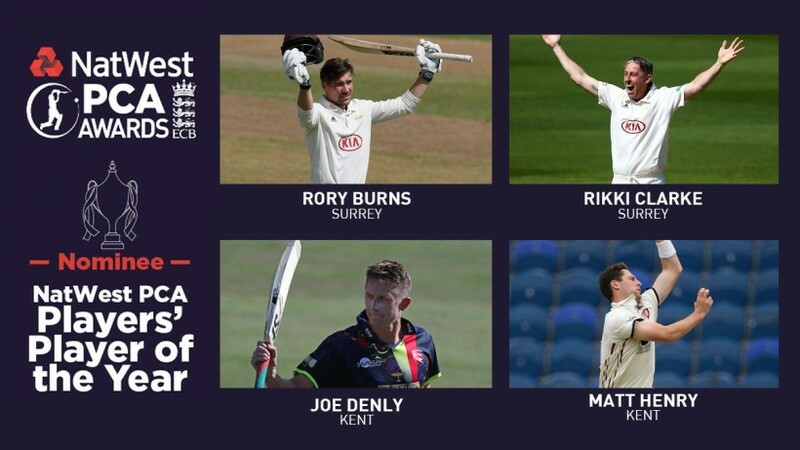 Joe Denly and Matt Henry have both been named on the four-man shortlist for the NatWest Professional Cricketers’ Association Players’ Player of the Year award. The Kent duo are joined by Surrey pair Rory Burns and Rikki Clarke. The highest individual accolade in English cricket with the award voted for by fellow professional cricketers, the winner of the NatWest PCA Players’ Player of the Year will receive the Reg Hayter Cup at the ceremony which takes place at the Roundhouse, Camden next Thursday October 4. Denly has had the season of his life and has been nominated by his peers for a summer of sensational performances with bat and ball. The 32-year-old looks set to win the PCA Most Valuable Player for 2018 to underline his brilliance in 2018 which has seen a call-up to the England Test squad for the tour of Sri Lanka. Denly was the Spitfires highest run-scorer in the Vitality Blast, guiding his side to the final of the Royal London One-Day Cup by averaging 70 and has scored over 800 runs at an average of over 36 to propel Kent to promotion in the County Championship. This season Denly showed he was a genuine all-rounder with the leg-spinner taking 20 wickets in the Blast, 14 dismissals in the 50-over competition and over 20 scalps in red-ball cricket. New Zealand fast bowler Henry has also been honoured by first-class cricketers in England and Wales. The 26-year-old has enjoyed two stints with the Spitfires in 2018 and has taken a staggering 75 first-class wickets, more than anyone in the country. Made even more impressive by only featuring in 11 games with him taking his scalps at an average of under 15 to play a huge role in ensuring promotion. Henry has taken five five-wicket hauls, including a career best 7-45 and has dismissed 10 batsmen in one match on three separate occasions. The seam-bowler also transferred his Championship form to the One-Day Cup, adding another 16 victims in a destructive summer.